Opis: Readings in English Social History, Vol. 3 - Morgan R. B. It is a truism that every great political upheaval is followed by a keener and livelier interest on the part of statesmen and the people generally in the social and industrial questions that, phnix-like, arise and demand settlement. The upheaval caused by the war has focussed the attention of the country upon the necessity for improving the social conditions of the people; and for many years to come legislation in the main will have to deal with the betterment of the conditions of life in its broadest and fullest aspect. A glimpse at the social conditions of the inhabitants of this country in the past will be a help towards the better understanding of what has gone to make "this little world... set in the silver sea" the cradle of a race of shopkeepers (as Napoleon dubbed us), and warriors, as we have proved ourselves to be. In these little volumes the editor has endeavoured to select from contemporary writers pen-pictures of the country and its inhabitants throughout the centuries: their mode of life; their food and clothing; their games and recreations; their feastings and their burials; their methods of fighting on land and sea; their laws and customs; their education; their instincts for trade; their pageants and their music; their joys and their sorrows; in fact, all that goes to make what we call "life." Szczegóły: Readings in English Social History, Vol. 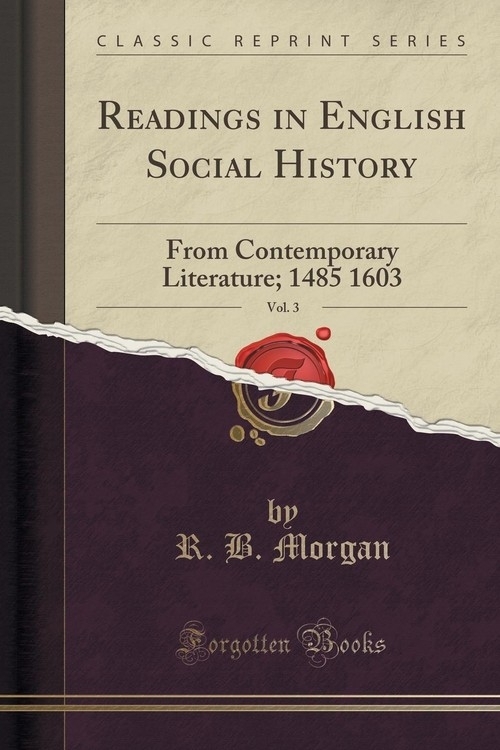 3 - Morgan R. B.
Recenzje: Readings in English Social History, Vol. 3 - Morgan R. B.